Visualise and manipulate your KNX / EIB installation with “bitwise controls” media remote control. The new BC1 controller allows to control your media systems through the KNX bus: Push a wall mounted button to change the volume of your amplifier. 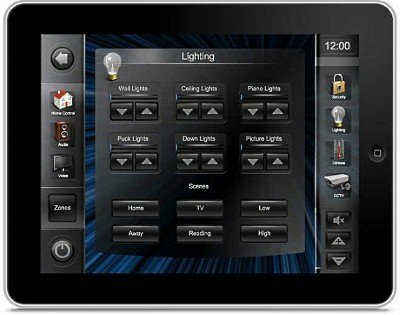 One App to control your whole media equipment and the EIB/KNX – bus installation. for iPhone, iPad and Android tablets or Smart phones ( Android 2.3 Honeycomb and higher). The cascadable configuration permits to control all of your AV equipment, receiver, TV, DVD player or even your whole multiroom system. As installer you may use free of charge the Project Editor Software to design the personal graphical user interface. Even if you do not feel capable to do this yourself, just drop us a line and we may offer you this service or we will find one of the hundreds bitwise partner close to your home. ProKNX offers a driver for the bitwise controls system to control the KNX/EIB installation. You may get free of charge the ProKNX driver as a software module to include in the Project Editor Software. In addition you’ll need the ProKNX-bwc or the ProKNX-IP+ gateway to establish the physical connection to the KNX bus. It is also possible to use KNX commands in BC4 macros with only one button press, as the driver is based on scriptDevice. This is to recall a KNX scene (dimming lights, closing shutters) when starting Home cinema e.g. Of course any user defined buttons or sliders may be used. However we added special GUI templates to start your project quite easily. The lower GUI is built up with Xenon Templates for BitWise Touch, by Custom Code Crafters.